When people think of Seasonal color , they are often thinking of bulbs and summer annuals, but there are so many more types of plants that give us seasonal color. 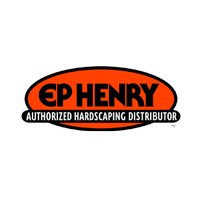 The most obvious other examples are flowering trees (Cherries, Crab-apples, Dogwoods) and shrubs (Hydrangeas, Shrub Roses, and 100’s of other flowering shrubs. When designing, trees and shrubs are the first plants that should be considered to give you a good framework, or the ‘bones’ of the landscape. 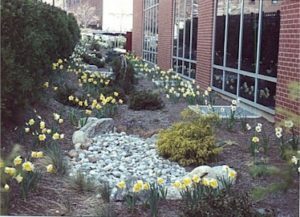 With a good structure of trees and shrubs in place, the final step is the addition of more color with perennials, bulbs and annuals. These finishing touches are often the most noticed part of a landscape. 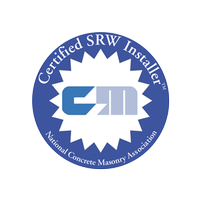 Color schemes can change with the season and can be changed year to year if desired. 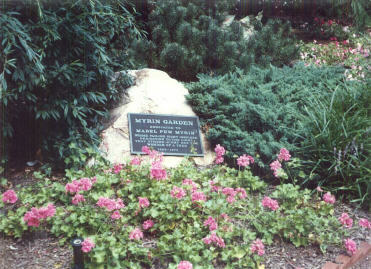 Plants in a given location are chosen by preferences for sun or shade and other factors, but sometimes experimentation can yield surprising results. Pansies, Tulips and other bulbs in spring; Impatients, Caladiums, Geraniums, Marigolds and other annuals in summer; Mums in fall, along with pansies and colorful kale and cabbages right through the winter. 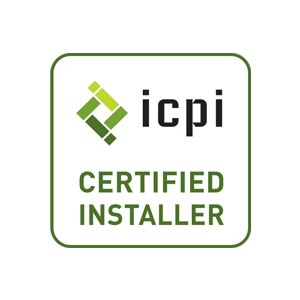 Add to this, dependable long lasting perennials for a property you and your neighbors can enjoy year round. 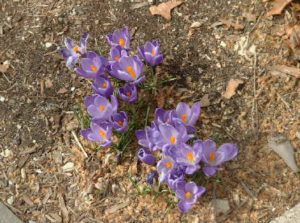 See my Perennial Page, Shrub Page, and Flowering Tree Page for additional examples of seasonal plants. Many additional Photos of Trees, Shrubs, Perennials, Bulbs, and Annuals can be seen in various albums on my facebook page. 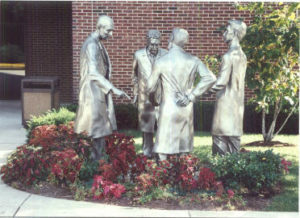 (Winter time, March, April, May, June), and in upcoming blogs on this site. Bulbs shown here are spring blooming bulbs that are best planted in fall. 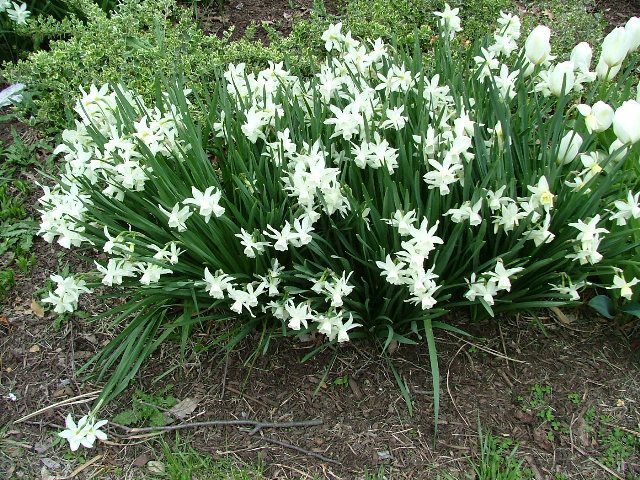 These bulbs like sun but the earlier varieties do very well under deciduous trees. These early bulbs grow before trees leaf out and get the sun they need in that way. 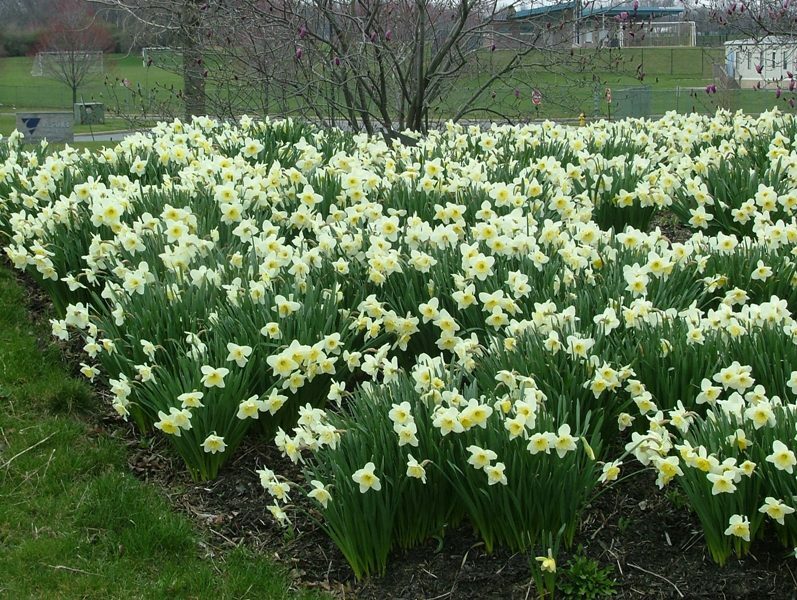 Bulbs usually look best if planted in groups of at least 5 to 9 bulbs per group. The flowers last for a couple of weeks (longer in cool weather and shorter in hot weather), but the flowers can come back each year for decades. 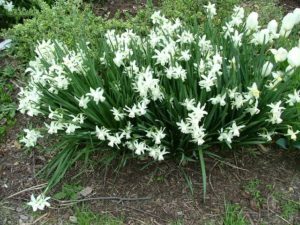 Because the foliage of these bulbs is often gone by the end of spring, summer annuals can be planted in the same area for months of color. Crocus: crocus bloom very early and come white, yellow, blue and purple. They can also be planted in lawns if the first cutting is delayed a little. 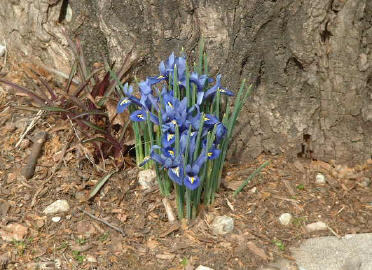 Iris cristata: these Iris bloom very early with crocus and come in blie and purple. There is also a similar variety that comes in yellow but it is harder to grow. Tulips: Tulips come in almost all colors and bloom in mid-spring. 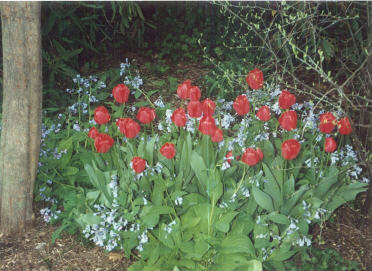 Tulips like well drained soil and most varieties will decline in just a couple of years if the soil is not right. Often times Darwin Hybrids are noted as the best varieties for long term establishment. Some major gardens replant tulips each year but I have seen a few plantings 20 years old. 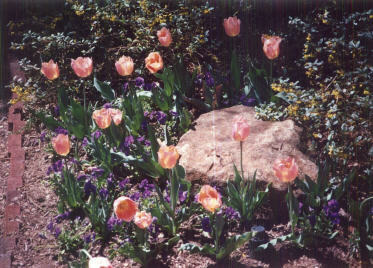 Tulips can be under planted with pansies or low growing perennials for very colorful displays. Squirrels seem to like the taste of tulips and sometimes dig up bulbs and replant them in other locations, and deer also love the taste of tulips. 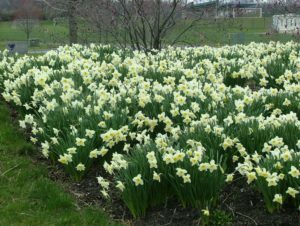 Daffodils: daffodils bloom in early spring and come in white, yellow, and bi-colors of white or yellow with yellow, orange and even pink. 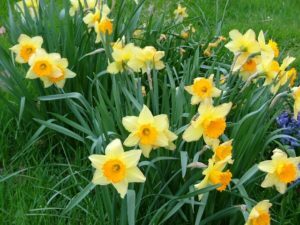 Daffodils are more reliable in later years and can multiply and last for decades if planted in a favorable location. The foliage can look messy a couple of weeks after blooming but will usually disappear a couple of weeks later. Squirrels and deer do not seem to bother daffodils. Annual plants last for less than a year. Because they do not have to save energy for the next year, annuals usually bloom heavily for extended periods. 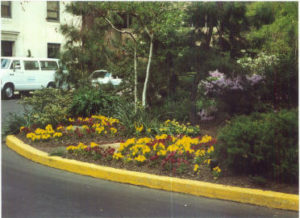 The disadvantage is that they have to be planted each year, but annuals can bloom for half a year compared to one month for many perennials considered to be long blooming. Some annuals such as pansies, snap dragons, and corn flowers like cool weather and are considered winter annuals. Many popular annuals such as impatients, marigolds, geraniums, and begonias like warm weather and are considered summer annuals. By interchanging winter and summer annuals you can get almost an entire year of color. 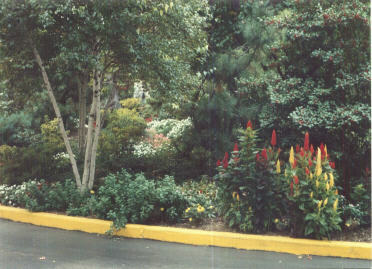 Annuals for shade: plants shown here are readily available. Caladiums: Very colorful leaves that seem to be the only annual that will grow in dense shade. Can be dug up and saved in a warm place, but tubers are inexpensive and it can be cheaper to treat caladiums as an annual. 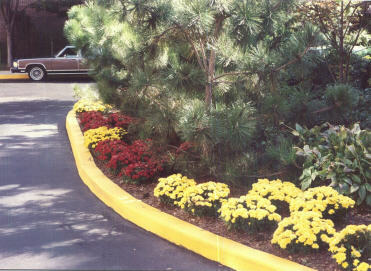 Plants don’t like cold weather and usually die off earlier than other annuals. 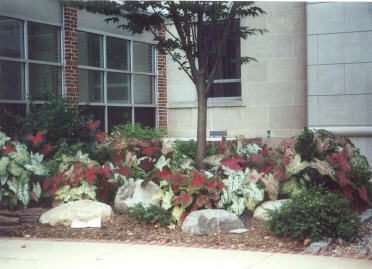 Coleus: coleus is also grown for its colorful leaves. New varieties are constantly being developed that expand the color range and leaf shape of these plants. The flowers that grow at the top of the plant are not as colorful as the leaves. Pinching the tops off when flowers start to grow encourages more leaf growth and bushier plants. 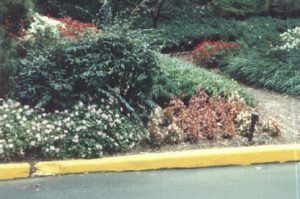 Impatiens: impatiens come in many colors and can brighten up semi-shady locations with plants that are almost completely covered with flowers. 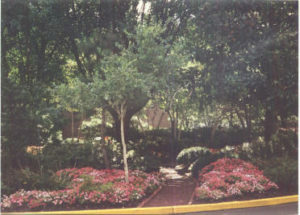 In dense shade, flowers can be sparse. Lately Downy Mildew fungus has killed off many plantings of impatiens. Begonias: begonias can take some shade, but like a little sun. They also need loose well drained soil and do not do well in heavy compacted soil. Begonias come in white pink and red; with leaves that come in red or green. 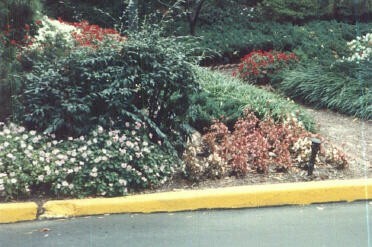 Shown here on right with annual vinca on the left. 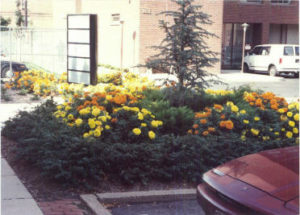 Annuals for sun: plants shown here are readily available. Geraniums: geraniums are an old fashion dependable annual. Colors range from white to pink, salmon and red. Geraniums do not like the soil too wet but can stand some heat and drought once established. 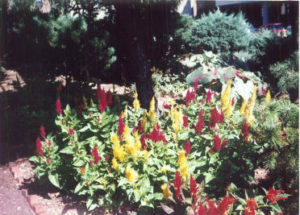 Celosia: celosia grows as upright colorful spikes. it come in yellow, orange, and shades of red, pink and purple. Like the other sun loving annuals shown here celosia can stand some heat and drought once established. Cool Weather Annuals: Plants shown here prefer the cool weather of fall, and some can last right through winter into spring. 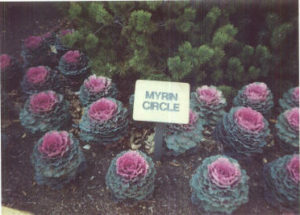 Cabbages and Kale: These plants are usually purchased fully grown. The center of the plant colors up as the weather get colder and frost is said to bring out the best colors. The colors are usually either red or white. They can take temperatures down into the teens and a covering of snow does not seen to hurt them much, but they don’t like to be coated in ice. Chrysanthemums: Very colorful fall blooming plants that are actually perennials but are hard to keep looking good the next year so they are usually treated as annuals. The blooms only last for a few weeks so I like to plant these only in very visible entrance areas, or for special occasions. 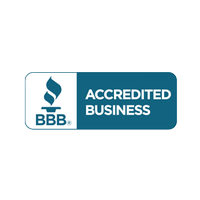 They are very popular in fall and can be purchased almost anywhere. 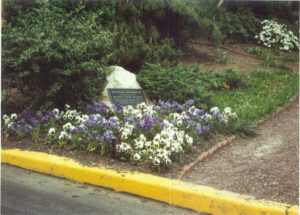 Pansies: pansies like cool weather and come in many colors and bi-colors. While pansies like sun they can often be planted under deciduous trees in fall and they will get the sun they need while the leaves are off the trees. Planted in September they can often last till the following June, often even having a few flowers during warm spells in winter.